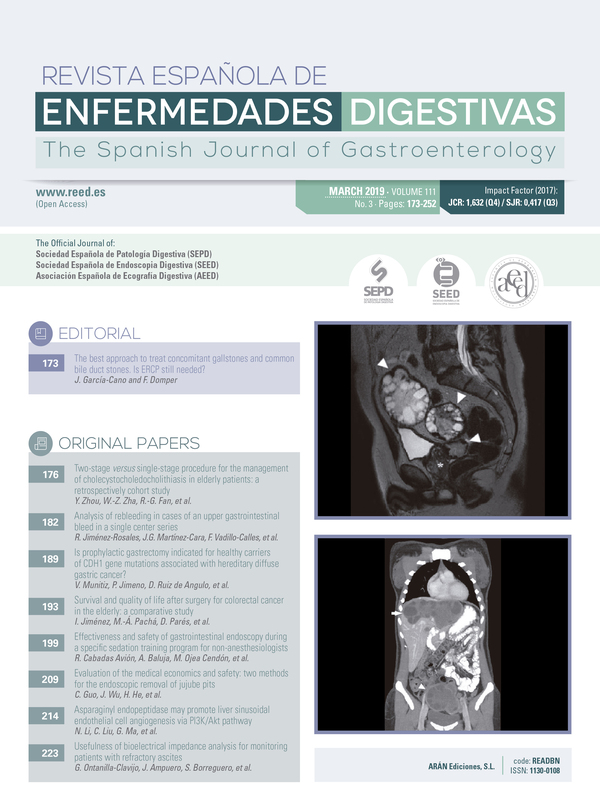 Background: upper gastrointestinal bleeding (UGIB) is one of the main causes of hospital admission in gastroenterology departments and is associated with a significant morbidity and mortality. Rebleeding after initial endoscopic therapy occurs in 10-20% of cases and therefore, there is a need to define predictive factors for rebleeding. Aim: the aim of our study was to analyze risk factors and outcomes in a population of patients who suffered a rebleed. Methods: five hundred and seven patients with gastrointestinal bleeding were included. Clinical and biochemical data, as well as procedures and outcome six months after admission, were all collected. Documented clinical outcome included in-hospital and six-month delayed mortality, rebleeding and six-month delayed hemorrhagic and cardiovascular events. Results: according to a logistic regression analysis, high creatinine levels were independent risk factors for rebleeding of non-variceal and variceal UGIB. In non-variceal UGIB, tachycardia was an independent risk factor, whereas albumin levels were an independent protective factor. Rebleeding was associated with in-hospital mortality (29.5% vs 5.5%; p < 0.0001). In contrast, rebleeding was not related to six-month delayed mortality or delayed cardiovascular and hemorrhagic events. Conclusions: tachycardia and high creatinine and albumin levels were independent factors associated with rebleeding, suggestive of a potential predictive role of these parameters. The incorporation of these variables into predictive scores may provide improved results for patients with UGIB. Further validation in prospective studies is required.